Absolare arrived on the high-end scene in 2012 with two striking products, the Passion preamplifier and Passion 845 power amplifier. Both components took minimalism in circuit design and user operation to an extreme—even eschewing front-panel markings on the preamplifier’s two knobs. In addition, the all-tube circuits were housed in chassis that established an entirely new visual aesthetic in audio equipment, foregoing shiny metal boxes and lots of knobs in favor of rich leathers and simple controls. And with 52W of SET output power, the Passion 845 brought the glories of single-ended triode operation to a relatively wide range of loudspeakers. Absolare’s new integrated amplifier (simply called the “Integrated”) is an attempt to capture that magic in a single chassis, at a lower price, and with more output power to confer compatibility with a wider range of loudspeakers. To create the Integrated, Absolare combined, in one chassis, the Passion’s preamplifier circuitry with a newly designed 150Wpc solid-state output stage. The Integrated hews to the Absolare aesthetic, with a narrow and deep chassis, leather-clad exterior, and just two front-panel rotary knobs, neither one marked. The left knob selects between one of four inputs, the right knob adjusts the volume. Two 12AU7 tubes at the front rise above the casework, and the solid-state output stage’s horizontal heatsinks consume the remainder of the chassis top panel. The leather, with contrast stitching, is exquisite. Visitors invariably want to walk up to the Absolare products and touch them; the components exude a warm and welcoming feeling compared with metal-chassis gear. Absolare offers a wide range of leather and stitching colors. The Integrated can be ordered with any combination of unbalanced and balanced inputs (up to four); my review sample was fitted with two of each. The unbalanced model sells for $24,750, with the balanced version fetching $26,500. Units with balanced inputs include a small toggle switch next to the inputs that engages a step-up transformer. This 4:1 transformer allows you to realize the best match between the source’s output level and the volume control’s limited range. That is, you should engage the transformer for lower-level sources so that the volume control is set about mid-way at a normal listening level. The volume control has a limited range because it is a stepped attenuator with discrete resistors rather than a continuously variable potentiometer. The rear panel also houses two pairs of very-high-quality binding posts, an on/off rocker switch, and an IEC AC input connector. A small slim remote control with three buttons (again, none of them marked) is included. In place of feet on the chassis bottom, the Integrated has cutouts for accepting the purpose-built “Quatro” isolation devices supplied with the amplifier. The isolation feet are heavy and elaborate, and feature a four-layer machined-aluminum structure designed to dissipate horizontal and vertical resonance. Absolare designs and manufactures these devices, and will soon bring them to market as part of a separate line of isolation products called Stabilian. The Quatro isolation feet’s four independently movable layers in a vertical stack reminded me of the massive earthquake-absorbing structures now being built into skyscrapers in earthquake-prone areas. 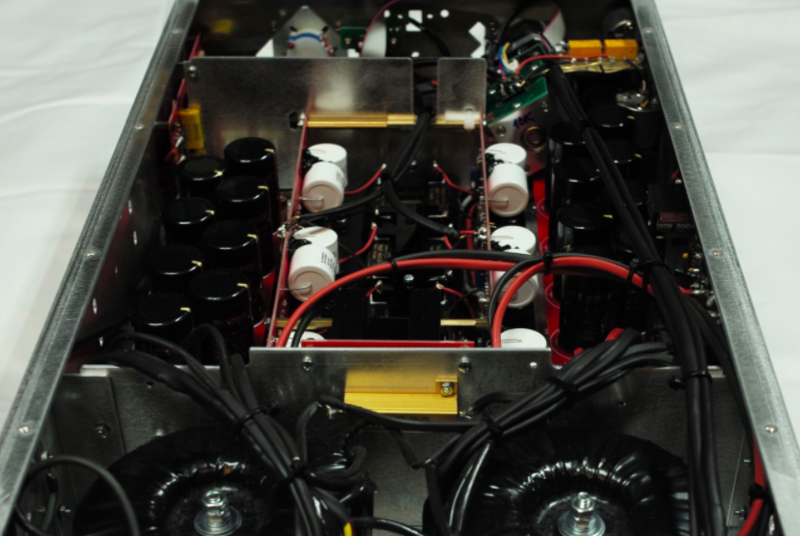 Taking a closer look, the Integrated’s aluminum chassis (hidden beneath the leatherwork) is divided internally into separate compartments for the preamplifier stage, power amplifier circuits, and power supplies. Interestingly, the signal connections between these sub-sections aren’t the usual strips of bare wire, but full-fledged interconnects made by Absolare’s sister company, Echole. In fact, all the cabling inside the Integrated is made from Echole’s proprietary mix of silver, gold, and palladium. Most of the voltage gain is supplied by the 12AU7 tube input and driver stages, with the transistor output stage supplying the current gain. Absolare voraciously scours the globe for tubes and has obtained large supplies of premium NOS types. The amp’s tube circuit is similar to that of the Passion preamplifier, with zero feedback and the tubes configured as mu-followers. The left tube is the input stage, the right tube the driver. It’s possible to mix and match tubes between these two stages to realize a particular sound. The solid-state output stage is built around three pairs of bipolar transistors per channel (12 transistors in total) for 150Wpc of output power.